Episode #43 Timecapsule: A journey into the original Old Ironforge subzone is an unforgettable experience. The large, circular cavern contains a majestic, purple-jeweled ceiling… its crystals glowing and pulsing from an unknown source. Beautifully carved stone bridges and natural gray pathways span the lava-filled cave floor. 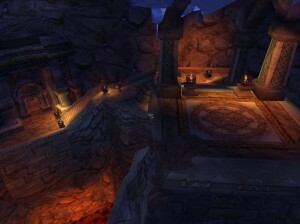 A high platform in the center of the Old Ironforge cavern stands empty and forgotten, however its ornate decorations hint that it may have been originally designed for a more important purpose. This second look into Old Ironforge describes what interesting features existed deep under Ironforge City, before Patch 4.1 removes these ‘vanilla world’ secrets forever.